Long lubricant life in high temperature operations — Outstanding thermal and oxidation stability. Long machinery life and maximum compressor efficiency — Oxidative stability and low carbon-forming tendencies minimize sludge and deposit formation. Long drain intervals — Long lubricant life means less frequent oil changes. 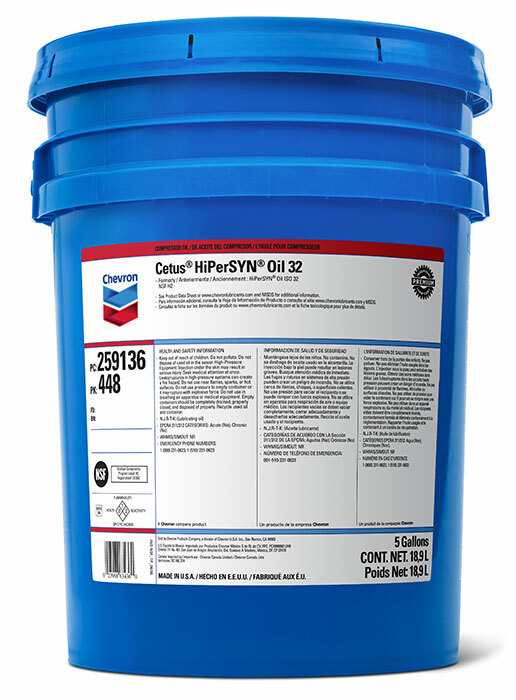 Cetus HiPerSYN Oils are formulated with premium base oil technology and a high level of purity and refinement, and has been further enhanced by their unique additive systems that provide outstanding thermal and oxidation stability, high viscosity index, high flash point, low pour point, anti-wear protection, and excellent hydrolytic stability. Recommended for air compressors, especially portable and stationary rotary, vane and screw compressors, and industrial bearings and gears that require an R&O type synthetic gear oil. Designed for applications with wider operating temperature ranges as compared to non-synthetic oils.